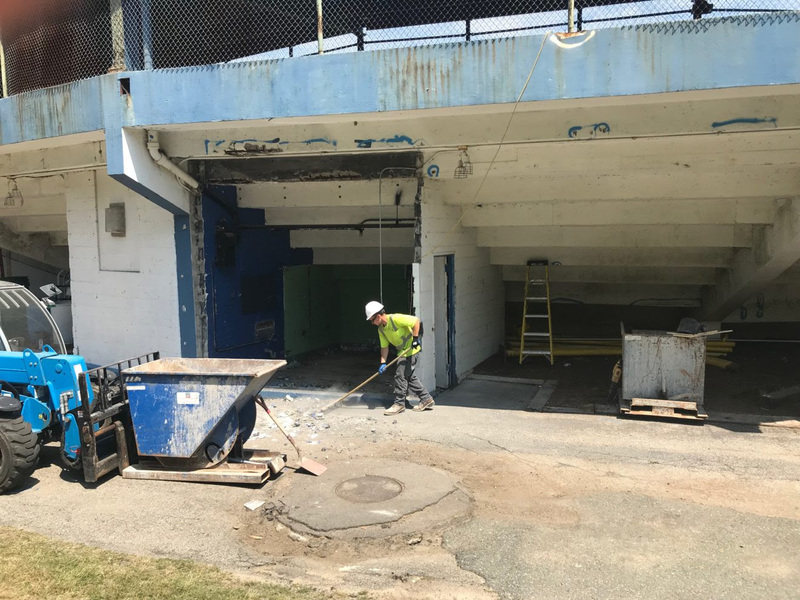 At 10:45 a.m. on Friday morning the Rockland world was shocked to see on the “The Real Rockland” Facebook page an alarming (and not sourced) post remarking how the 2019 graduation may break the long tradition of being held in the Veterans’ Memorial Stadium, and instead may have to be held inside RHS. Screenshots were emailed to the Veritas by a follower of this Facebook page. The “news” spread rapidly through “The Real Rockland’s” Facebook community as well as the senior class. The post sourced this breaking information to a “little birdie” who was not the poster’s child, and instead to a member of the senior class who had spoken to Principal John Harrison. However, regarding the “little birdie” who had relayed the information to the Facebook poster, Principal Harrison confirmed to the Veritas, “No student talked to me.” He also said, “No student contacted me, no parent called or emailed” to verify the validity of the rumor after it had been posted. Veritas received screenshots from an adult follower of the Facebook page. 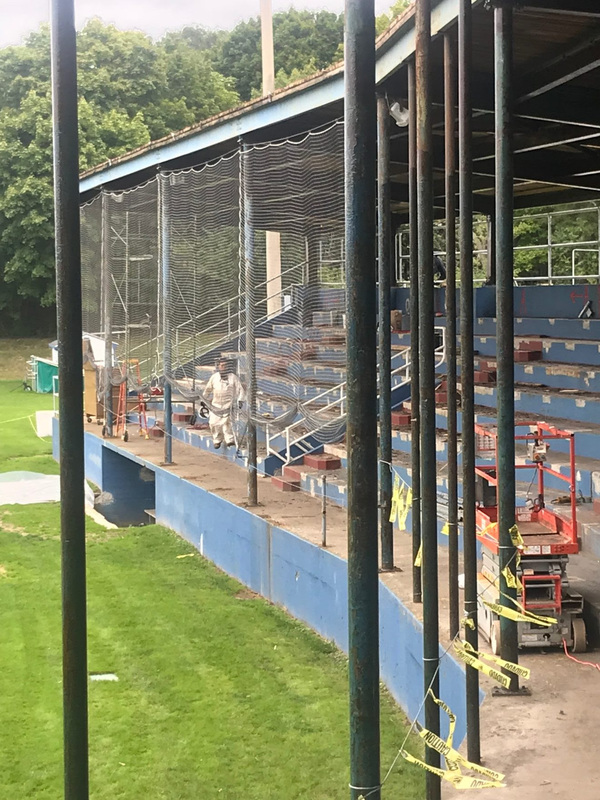 One of 55 comments to the original post, citing the “fake news” in the post, referred to a press release from Interim Town Administrator, Marcia Birmingham sent to the media that states, “The project (the stadium) is expected to be completed in the springtime, in time for Rockland High School’s graduation ceremony May 31.” But responses to that comment said that “expected to be” is not a confident reassurance for its completion in time. Realizing that social media is not the place to get the facts, the Veritas contacted Park Department Superintendent, Peter Ewell and Commissioners of the Park Department, Richard Furlong and Joe Reis who helped the Veritas to dispel the rumors. Additionally, Mr. Furlong in his email response to our question said, “Work is going to start up again next week.” He added that weather will play a role in the project. Top Left to Right: Tyler Gambon, Lara Glennon, Matt Bruzzese, John Ellard, and Jacob Leahy. Middle Row Left to Right: Miku Yoshioka, Katy Buckley, Maddie Gear, Kate Burke, Marissa Smith, Jasmin Morse, Francisco Oliveira, and Tyler Beatrice. Bottom Row Left to Right: Emily Gaboriault, Carolyne Lage, Greta Russo, Lauren Dracchio, Justin Sherlock, Grace Henry, and Caitlin Cameron. RHS MASC-goers participating in annual Polar Plunge to support Special Olympics. RHS seniors attending their final MASC Conference. Top Left to Right: Kate Burke, Caitlin Cameron, Marissa Smith, and Jasmin Morse. Botton Left to Right: John Ellard, Justin Sherlock, Francisco Oliveira, and Tyler Beatrice. 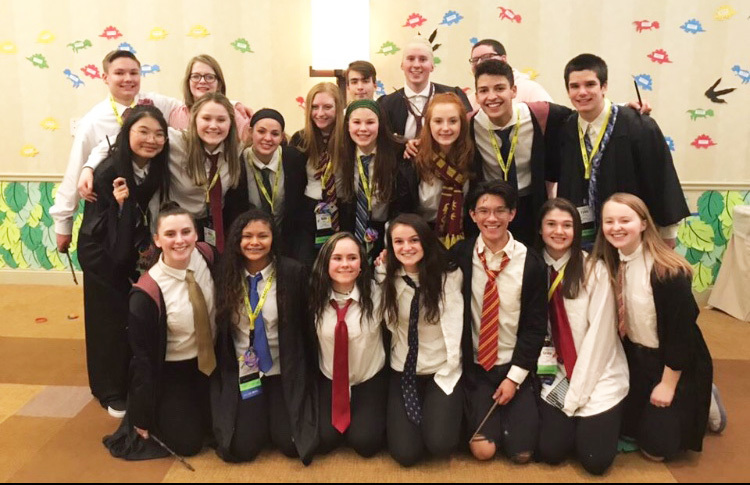 Each year, the RHS Student Government Council selects 15-20 outstanding leaders to attend the annual Massachusetts Association of Student Councils (MASC) conference that takes place at the Hyannis Conference Center for three days in early March. This year 20 students embarked on this journey with SGC advisors Joanne White and Jill Delaney on March 6-8 where they encountered remarkable keynote speakers, attended beneficial workshops, and collaborated with people all over the state to better their councils. Additionally, free time was taken as a council to bond and grow a better connection to one another, making for a more communicative and understanding council. Each year, RHS participates in the annual Polar Plunge to support the Special Olympics. Despite the weather being a balmy 26 degrees, five of the RHS MASC-goers dove into the icy Atlantic after RHS donated money to support the cause. Plungers were: Justin Sherlock, Maddie Gear, Jasmin Morse, Francisco Oliveira, and Carolyne Lage. Later on in the day, RHS participated in the annual MASC Lip Sync competition. Originally the group thought they would be unable to participate because they were put on the wait list due to a delayed sign up. To their surprise, four days before the conference they were notified by MASC officials that a team had dropped out. In turn, this gave them a small window of time to put together a lip sync and routine. But as usual, with the challenge presented, they decided to take a chance and put in all the time and effort they had to throw together a routine. In the end, they were named second place champs in the competition with a magical Harry Potter themed routine. On the last day council awards were announced, and RHS won the Top Ten Award that honors a council’s work in a school-specific project. Rockland received the award for their work in making SGC Summer Camp such a success. 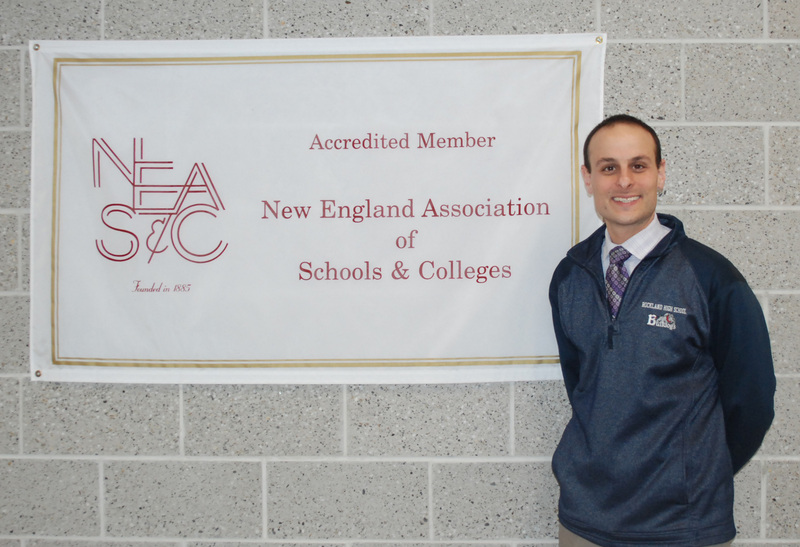 Additionally, officials from MASC ask all councils to provide excellence books that mark indicators of the councils’ success and participation in projects in the school and statewide events. When looking through each book they mark down by points if a council meets the criteria and then names them a Bronze, Silver, or Gold Council of Excellence. Rockland’s council was named a Silver Council according to these requirements. All in all, it was three days filled with fun, leadership, and learning that the students will bring back to better the RHS Student Government Council. Super Bowl MVP Julian Edelman at the parade on Monday, Feb. 5, 2019. Boston Globe photo by Barry Chin. 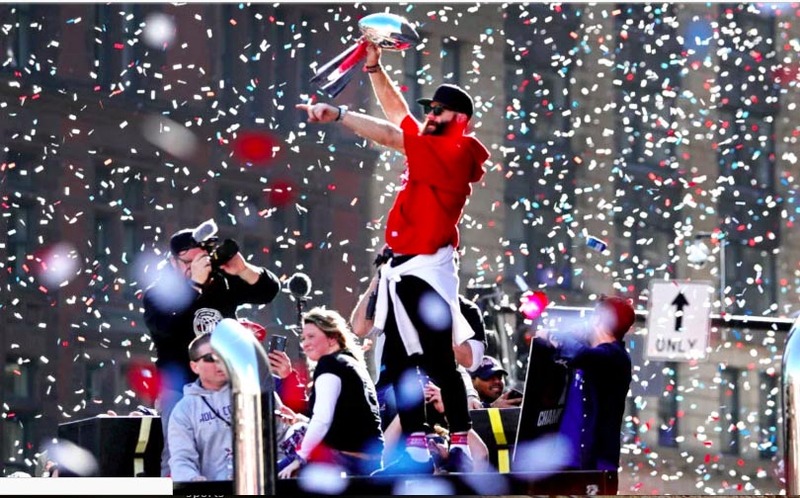 With last Sunday’s New England Patriots victory against the LA Rams by a whopping score of 13-3 at Super Bowl LIII, yesterday, Tues. Feb. 5, called for a Boston tradition: a Super Bowl Victory Parade. 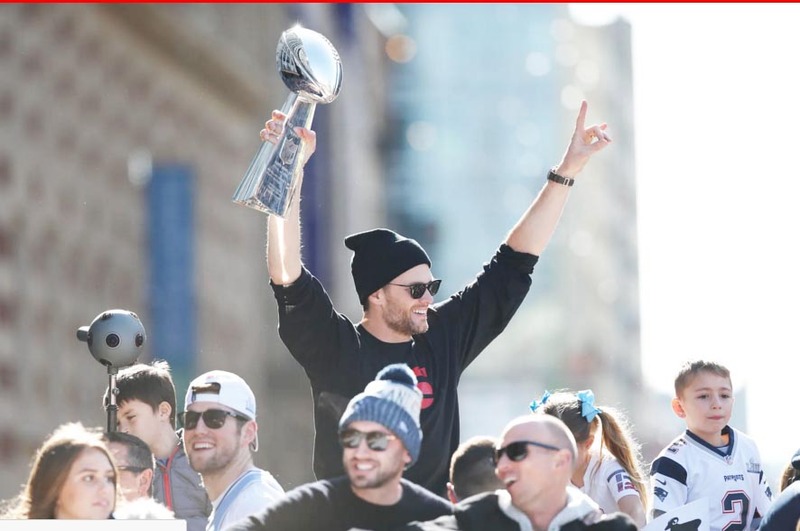 Yesterday, people crammed onto the streets of Boston and Boston Common to celebrate their favorite players, coaches, staff, and cheerleaders as they rolled down the streets in duck boats and were welcomed home with the Lombardi trophy as their souvenir from Atlanta. As for Rockland, many teachers planned for their class attendances to be lower than normal on the day of the parade as many students noted that they would not be coming to school. In total, RHS noted nearly 200 students to have been absent on parade day. Whether these absences were parade-related or due to it being flu season is not specified. All in all, with unseasonably warm weather, the crowds flocked to Boston to show their love and support for Tom Brady, Julian Edelman and all the New England Patriots. People young and old celebrated their outstanding year and all the accomplishments the team had as a whole. Whether seeing Brady was your favorite part of the day, going out into the balmy spring-like weather, or simply absorbing Patriot pride, everyone who went to Boston yesterday is sure to have had an unforgettable day.